1860 Deans Marsh Rd, Lorne. Four km from Lorne on the Deans Marsh-Colac Rd. Ocean and bush views, cosy wood fires and double spa baths make Lorne Bush House cottages perfect in either Summer or Winter. Only 5 minutes drive from the beach, shops and fabulous cafes and restaurants of Lorne, the cottages are a great alternative, where peace and privacy is assured and everyone can enjoy the sounds and silence of the bush, the friendly wildlife and the beautiful views. The five fully self contained cottages are set on 43 acres of private bushland and also offer a full kitchen, TV/VCR, complimentary video library, CD player, air conditioning, large deck, and private BBQ. All linen is provided. Just for fun there is an adventure ropes course, a bush volleyball court, a yabby dam and walking track. The cottages are suitable for both romancing couples with their spas, fires, privacy and seclusion as well as for families spending quality time together. 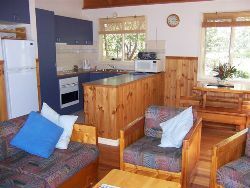 Lorne offers a smorgasbord of activities in both Summer and Winter and Lorne Bush House cottages are the perfect retreat from which to partake of it all. Cancellation and Refunds The deposit is refundable, less 10% of total tariff per cottage booked, [cancellation fee], if cancellation occurs more than 14 days prior to arrival date. If less than 14 days to arrival date, the deposit is refunded, less the cancellation fee, only if another guest rebooks the dates of your booking. Deposits A deposit of 50% of total booking is to be paid immediately, by credit card or cheque to secure a booking. The balance of the tariff is payable on arrival. Smoking Smoking is not allowable inside cottages but is allowable on decks and around the property. Pets Unfortunately, due to wildlife on the property, we cannot accommodate pets. Children Cots, high chairs and stair gates are available, free of charge, on request.